India, December 12, 2016: Strontium Technology Pte Ltd, a leading digital storage manufacturing company with headquarters in Singapore, brings for you an extremely powerful and elegant flash drive. Ammo USB 3.0 is a true beauty clad in robust body and stylish metal finish. 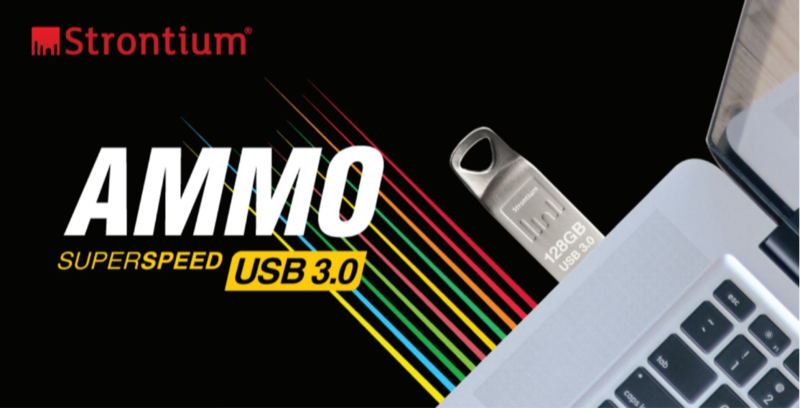 An upgraded version of our classic metal body premium USB series, Strontium AMMO USB 3.0, comes with a read speed up to 120MB/s and write speed up to 75MB/s. This is one of the fastest USB drives in the market and transfer files up to 18 times faster than standard USB 2.0 drives. * It’s ideal for desktops and notebooks with USB 3.0 ports and it is also backwards compatible with USB 2.0. 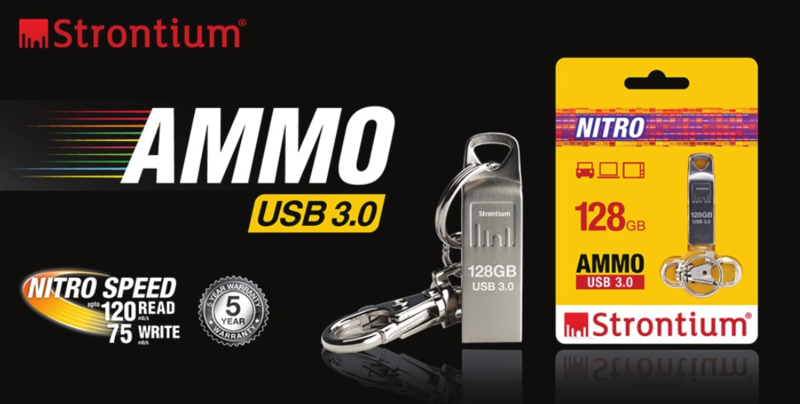 “We are excited to add Ammo USB 3.0 to our existing range of fast and elegant USB Flash drives for our customers.” said Vivian Singh, President & CEO, Strontium Technology Pte Ltd.” “It’s a perfect choice for facilitating ultra-fast and multi-stream data transfer that gives an ease of using a superfast drive experience”, he further added. It’s sleek, strong metal body and premium metal key chain, provides extreme convenience to the users to carry their music, photos, videos and other data around with ease and assurance. It is perfectly engrafted with a high level of elegance and possess a superior performance that will set your heart on fire! Best of all, AMMO is backed by a five-year warranty and the reliability of Strontium. It comes with capacity of 16GB, 32GB, 64GB and 128GB and pricing of INR 610 onwards. It will be available in all leading online platforms in India. Strontium Technology Pte Ltd is a leading digital storage manufacturing company with headquarters in Singapore. Founded in 2002, we have spread out operations span to varied territories across Australia, New Zealand, South East Asia, India, Africa, Middle East, US, Russia, Canada and Latin America. In total, the company maintains a strong market presence in over 35 countries. Strontium Technology serves an international network of distributors, resellers, retailers and OEM customers. The company offers an extensive range of digital storage products which addresses the requirements of enterprises as well as individuals. As of today, Strontium has a total manufacturing capacity of 500,000 memory modules and 7,000,000 flash products every month. Note: *128GB only: write to drive up to 25 times faster than standard 2.0 drives (4MB/s). USB 3.0 port required. Based on internal testing; performance may be lower depending upon host device. 1MB: 1,000,000 bytes.